SACRAMENTO, Calif. -- The California Legislature's widening sexual misconduct scandal now includes allegations against a Democratic lawmaker known for her fierce advocacy on women's issues, including an anti-sexual harassment movement that began sweeping the Capitol last fall. 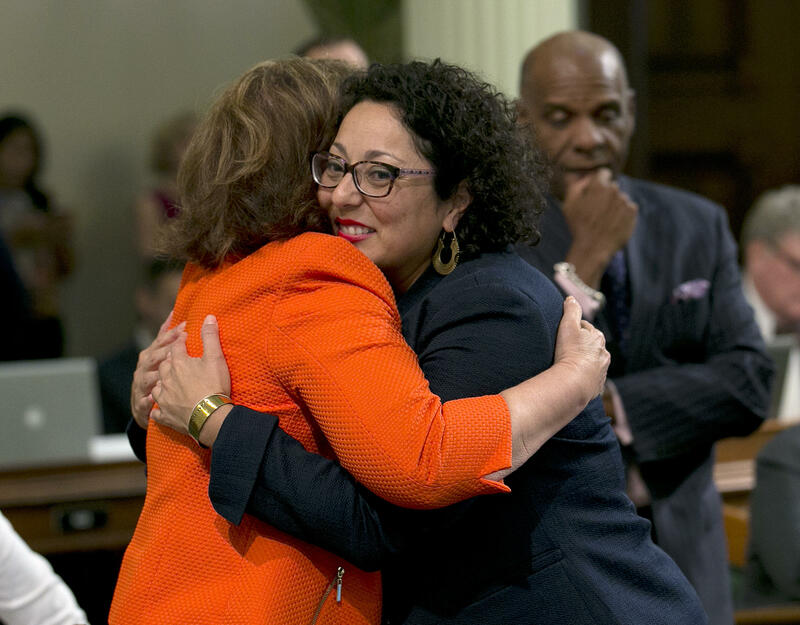 Assemblywoman Cristina Garcia said Thursday she'll fully cooperate with an investigation into an allegation she groped a 25-year-old man who worked for another lawmaker in 2014. Daniel Fierro alleges that she stroked his back, squeezed his buttocks and attempted to touch his crotch in the dugout after a legislative softball game. Garcia said she doesn't recall the incident. Fierro didn't report it at the time but in January told his former boss, Democratic Assemblyman Ian Calderon, who reported it to Assembly leaders. Speaker Anthony Rendon confirmed an investigation is underway on Thursday, after Politico first reported it. "I trust that while the investigation proceeds Assemblymember Garcia will respond appropriately and in a way that fortifies the Legislature's effort to create a new climate," he said in a statement. Garcia is the latest lawmaker, and the first woman, in the California Legislature to face accusations following the #MeToo movement, which began last fall as a social media campaign used by millions to tell personal experiences with sexual harassment. Garcia told CBS News last year that a lobbyist grabbed her inappropriately several years ago and that the issue of sexual harassment is not only non-partisan, it shouldn't even be just a women's issue. "It's not our responsibility, it's not the victim's responsibility. It's how do those with power, how do they help fix this problem," Garcia said at the time. About two dozen sexual harassment allegations were made against Assembly lawmakers, staff and lobbyists in 2017 - the most within a single year since 2006 - and at least eight allegations are pending, according to documents released last week. "Every complaint about sexual harassment should be taken seriously and I will participate fully in any investigation that takes place," the Los Angeles-area lawmaker said in a statement. "I have zero recollection of engaging in inappropriate behavior and such behavior is inconsistent with my values." Fierro said he decided to tell Calderon about the incident because of Garcia's outspokenness in the #MeToo movement, which has led to investigations in statehouses nationwide. She quickly condemned male colleagues who were accused of sexual misconduct last fall, allegations that prompted two to resign. This Monday, she spoke at a rally outside the Capitol in favor of legislation signed by Gov. Jerry Brown giving legislative staff members whistleblower protections for reporting sexual misconduct or other misbehavior. Politico also reported that a lobbyist who declined to be named claimed Garcia made crude sexual comments and tried to grab his crotch at a 2017 fundraiser, an incident he did not formally report.